Princess cut is one of the most sought-after diamond cuts, second only to the classic round cut in popularity. Princess cut diamonds have a square shape when looked at from above and are a good choice for engagement or wedding rings. Let’s take a look at the most important facts you should know when shopping for princess cut stones. Princess cut diamonds are generally cheaper per carat compared with their round cut counterparts. The main reason for this is that when raw diamond is shaped into a princess cut, less material is wasted than when cutting a round stone. Click here to check out current prices for princess-cut diamonds. One of the good things about princess cut is that its proportions allow it to exhibit a decent amount of brilliance and sparkle, which make the stone’s inclusions less visible. 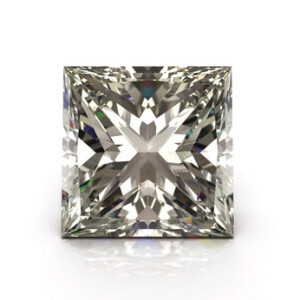 It is worth noting that princess cut diamonds with clarity lower than SI1 are rare. That’s why the best way to find a stone with decent clarity at the lowest price is to focus on stones graded VS1, VS2 and SI1. When looking at diamonds in this clarity range, look for stones that don’t have inclusions visible with the naked eye. Click here to take a look at real VS1/VS2/SI1-clarity princess-cut diamonds. There is one other thing you should pay attention to: Make sure that the stone you choose doesn’t have serious inclusions in its corners, which are the weak spots of this cut. If there are large inclusions in these places, the corners will be weakened even further and be more prone to chipping. When evaluating the color of a princess cut diamond, look for stones that don’t have a visible yellow tint. This means that you shouldn’t go lower than the Near Colorless range (which contains the G, H, I and J grades). Click here to see a selection of G/H/I/J-color princess-cut diamonds. Although with round cut stones you have more leeway in terms of color (i.e., stones graded J or even K can still look reasonably colorless because the cut masks tints well), with princess cut diamonds you shouldn’t go lower than the I-color grade or you will start seeing some yellow. Should you go even higher and buy a Colorless princess cut stone (i.e., one graded D, E or F)? It is up to you, but it is usually not worth the additional money you’ll pay as you won’t be able to see a noticeable difference in color with the naked eye. When it comes to assessing cut quality, there is no uniform agreement as to what proportions the best princess cut should have. Even if the diamond you buy is certified by the G.I.A. (Gemological Institute of America), its cut won’t be assigned an overall quality grade in the grading report (unlike the round cut). You will only be able to see a grade for the diamond’s polish and symmetry, which should have a grade of at least Good. Generally, the best cut will maximize the stone’s brilliance, without making the diamond look too deep or too shallow. The rule of thumb for princess cut diamonds is to look for stones whose total depth (or height) is about 70% of their width (5 percentage points should be an acceptable deviation from this number, up or down). When looked at from the top, the diamond should look square (stones that look rectangular are usually cheaper). Click here to see a selection of princess-cut diamonds that look reasonably clean and colorless, and are quite affordable for their high level of quality. When buying a princess cut diamond, you should make sure that it is set in a mounting that protects the stone’s corners. Since this is where the diamond gets very thin, if the corners are not well protected, a strong blow can chip them. A V-prong setting, for example, is a great choice for keeping a princess cut stone safe. A note on diamond accents: If your princess cut diamond is going to be set together with other stones, make sure that the accent diamonds are the same color as the center stone or no more than one grade apart. Where to Buy Diamond Jewelry? We recommend James Allen (read review) because you can see a 360-degree video for any diamond before buying it. Are There Ways to Improve Diamond Clarity? VVS and VS Diamond Clarity Compared: What Is the Difference? What Are the Proportions of the Ideal Diamond Cut? Should You Buy Diamonds Loose or Mounted? Should You Always Prefer Colorless Diamonds? What Are SI2 Clarity Diamonds and Are They Worth Buying? More detailed information on the princess cut. Diamonds vs. Other Gemstones: Which Should You Buy? What Are G-Color Diamonds and Are They Worth Buying? Man-Made Diamonds vs. Cubic Zirconia: What Is the Difference? What Is the Value of Diamond Chips?